Even if you don’t believe in ghosts, there sure are some spooky homes in the United States. Many homes in the U.S. have become famous for being haunted. Guests leave the haunted homes with stories of lights flickering on and off, footsteps and voices echoing when no one is around, no one is saying anything. Spooky! We’ve broken down our top ten picks of the homes that are most likely to be actually haunted. People have died in them, and these houses have odd backstories and weird (almost unexplainable…) things have happened in them. As it stands today, the Whaley House looks a touch different than the gallows which stood on the land in 1852. In 1852, James Robinson was hanged for grand larceny on the land which became the Whaley House. The paper reported that, “kept his feet in the wagon as long as possible, but was finally pulled off. He swung back and forth like a pendulum until he strangled to death.” A few years later, in 1857, Thomas Whaley constructed the home. Soon after moving in, the entire family reported hearing the heavy footsteps of “Yankee Jim” throughout the house. Nowadays Yankee Jim isn’t the only ghost in the house. Visitors often report seeing the apparitions of both Thomas and Anna Whaley walking the halls. Violet, one of the Whaley children, committed suicide in the house, after a painful divorce. Violet’s ghost hovers near the second floor, where she stayed most during the time between her divorce and death. Lights in the house flicker on and off at random. Visitors have reported feeling a breeze in windowless hallways. Visit: You can participate in a self-guided tour of the Whaley House most days of the week. Ticket prices are $10 for daytime tours and $13 for nighttime tours. Although a reservation is not required, you can click here to read more information about tour times and ticket discounts. The Lizzie Borden House. While this is a modern picture of the house, crime scene photos from the day of the murder can be found here. Warning: They’re a bit spookier than the house in fog today. Lizzie’s behavior surrounding the death of her father and step-mother was odd and she quickly became the center of the police’s investigation. However, despite her odd actions (and that she had attempted to purchase a poison the day before the murder), Lizzie was acquitted during the trial. Many believe the ghosts of Abby and Andrew Borden still occupy the house. Visit: You can go on an hour long tour of the house almost any day of the year for $20. Information about tour times and prices are here. You can also spend the night at the Lizzie Borden House, by reserving a room here. Notably, the John V. Morse Room is where Abby Borden’s murder occurred. 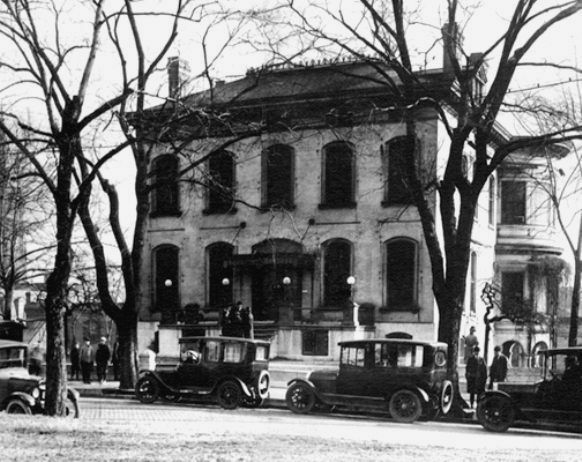 The Lemp Mansion, shortly after the death of William Lemp Jr. in 1922. The mansion was built in 1868 by Jacob Feickhart, but William Lemp Sr. bought and moved into the house in 1876. The Lemp family operated the Western Brewery, which became the largest brewery in St. Louis. Over the course of the 73 years the Lemp family lived in the mansion, four out of the seven family members committed suicide. Their ghosts may still haunt the mansion. Visit: Experience a ghost tour most Monday nights at 7 p.m. for $25. Call 314-644-1814 for reservations and more information. If you dare, you can also spend the night in the mansion. For information regarding an overnight experience, call 314-664-8024. While the Bellaire House does ooze some pretty creepy vibes, we’re not sure if it looks exactly like a portal to hell. 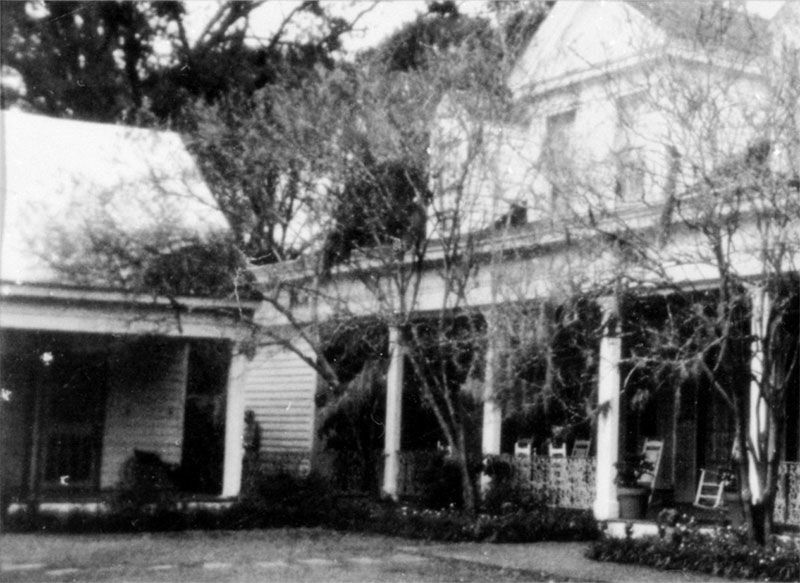 The Bellaire House gained a reputation for being haunted after it was abandoned for a number of years; however, spooky sightings didn’t properly begin happening until the current owner moved in. One evening, Kristin Lee was napping on the couch when a gray apparition appeared in front of her. She asked the man who he was, but he simply disappeared into thin air. Over the next few weeks, her family consistently heard strange voices and footsteps throughout the house. The climax occurred when a strange force hurled Lee’s dog against the bedroom wall. The family moved out, attempting to rent the house, but no family would stay for longer than a few months. Finally, Kristin Lee attempted to sell the house to the town for $1, but no one would take the house. Who actually haunts the house? The house was built by Jacob Heatherington in 1904, who also owned a coal mine that ran directly beneath the property. When Jacob died, he left the home to his two children, Eliza and Edwin. Soon afterwards, Eliza died of a heart attack in the living room of the house. Distraught, Edwin reached out to mediums to try to communicate with his sister. Legend claims that Edwin may have opened portals to the “other side,” allowing ghosts and demons to pass through. It is also rumored that the house sits next to Native American burial graves. You can actually tour the Bellaire House and book an overnight trip. According to TripAdvisor, most guests have had an interesting experience, as the energy level in the house is, “off the carts.” If you don’t want to visit the house yourself, here’s a video of some guests’ overnight experience. Visit: $400 for an overnight stay, to reserve your spot, click here. The primary ghost said to haunt the property is that of Chloe, a slave, whose apparition was reportedly photographed by the current landowners in 1992. But “Chloe” isn’t the only strange feature of the property. One employee, who was hired to greet guests, saw a woman in an old-fashioned white dress vanish through the front door, without opening it. There was only one murder on the plantation, that of William Winters. William was an attorney, who lived on the plantation in the late 1860’s. In 1871, he was shot by a stranger. He staggered inside, dying while trying to climb up the stairs. Guests often claim to hear his final footsteps. Visit: Daytime tours are available for $15 every day of the week and can be booked online here. Evening tours occur on Friday, Saturday, and Sunday nights for $15 and can be booked online here. You can also spend the night on the property, with rooms ranging from $175 to $400 a night. Information about each room available can be found online here and a reservation can be made by calling 225-635-6277. 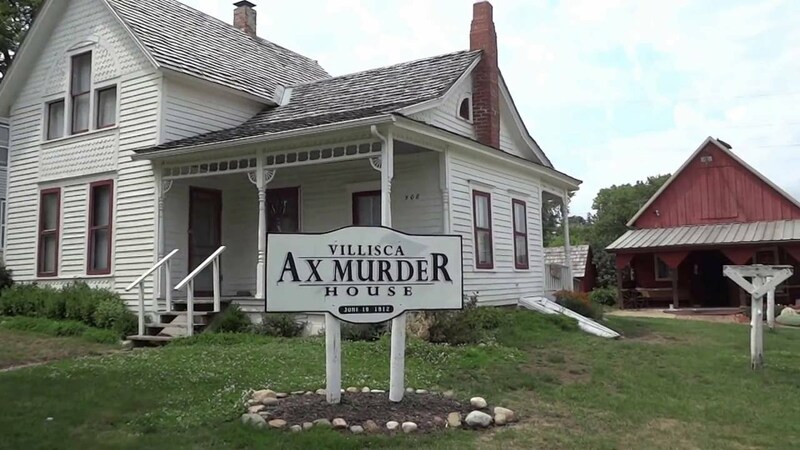 From behind the gruesome sign, the Villisca Ax Murder House looks quaint, giving true insight to how horrific the murders were to the small town. Sometime between midnight and 5am on the morning of June 10, 1912, six members of the Moore family and two houseguests were brutally murdered, having been attacked with an ax. The deceased included John and Sarah Moore and their four children: Herman, Mary, Arthur, and Paul. The houseguests were friends of the children, Ina Mae and Lena, whom Mary had invited to spend the night the day before. All of the victims were found in their beds, their heads covered with bedclothes. Lena was the only victim to have shown defensive wounds, indicating that everyone else in the home was likely asleep when killed. Their murder still remains unsolved. Visitors to the house often report emotional and physical disturbances during overnight visits to the house. Often, children’s voices can be heard echoing through the house. Even those who don’t believe in ghosts generally report feeling creeped out in the home. Visit: A daytime tour of the house is only $10, with discount rates for children and seniors. An overnight visit is a minimum of $428, which allows up to six house guests. Both tours and overnight reservations can be arranged by calling 712-621-1530. The beautiful landscaping of the Winchester Mansion hides the mysterious stairwells and rooms within the house. The Winchester Mansion was the bizarre creation of Sarah Winchester, the widow of William Winchester and heir to the gun company. 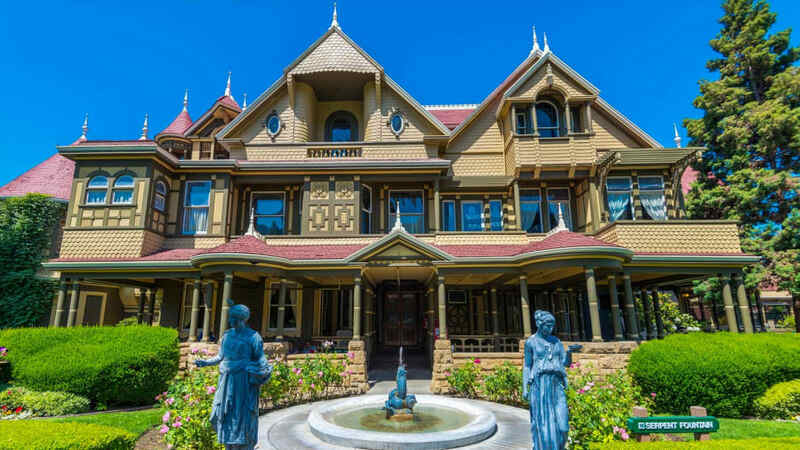 After the death of her husband and daughter, Sarah moved to California and began the construction of the Winchester Mansion. Sarah believed her fortune was haunted by ghosts and built the mansion to appease them. Everything about the home is odd: windows which overlook other rooms and doors and stairs which go nowhere. Tiffany, of Tiffany Co., personally designed a window so that when sunlight strikes it, a rainbow is cast across the room. The window was installed in an interior wall, in a room with no light exposure. The mansion contains 40 bedrooms, 2 ballrooms, 47 fireplaces, 17 chimneys, 2 basements, and 2 elevators. It is said that the ghosts of those killed by Winchester rifles still haunt the mansion. Visitors also have claimed to see the “wheelbarrow ghost.” The apparition wears white overalls, is incredibly kind, and apparently worked constructing the house. Despite the questionable presence of ghosts, the design of the house is undeniably odd. Visit: Tickets can be purchased online here, with prices ranging from $20 to $49, depending on the tour experience. You can also purchase tickets to a special Friday the 13th flashlight tour of the house, by buying them here. 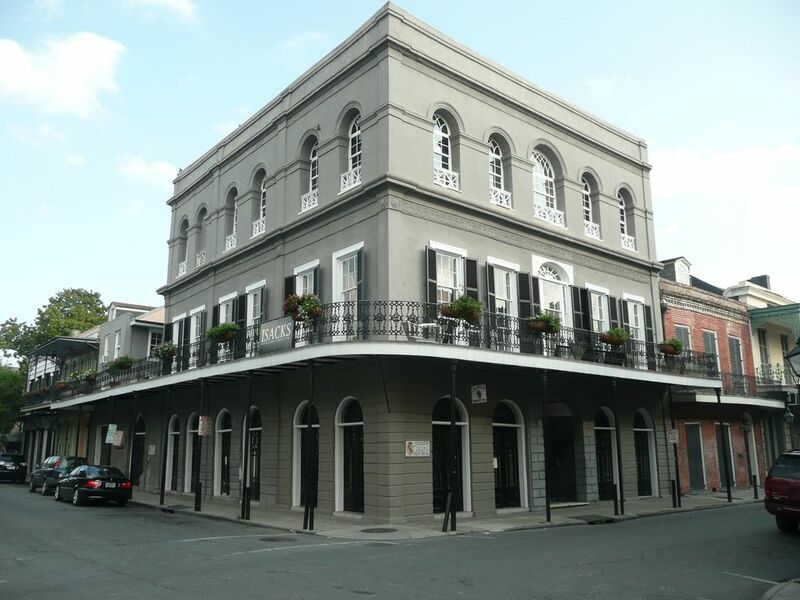 Now a corporate office, the LaLaurie Mansion blends into the buildings around it. But don’t let the second-floor shrubs fool you — truly horrific things occurred in the home. By 1834 it was revealed all was not as it seemed in the LaLaurie Mansion. The mansion was occupied by the socialite Delphine LaLaurie and her third husband. Starting in 1831 rumors of LaLaurie mistreating her slaves arose; however, in public she was polite to everyone and no rumor could be confirmed. But a neighbor said that she saw a young slave fall to her death from the roof, while trying to avoid being hit with a whip. All of the rumors were confirmed in 1834, when a fire broke out in the mansion. When firemen got there they found a 70 year old slave chained to the stove, claiming that she had started the fire as a suicide attempt to avoid being punished. When police went into the slave quarters, it looked like a horror chamber. The tortured spirits are said to haunt the house. Visit: In 2007, actor Nick Cage purchased the home for $3.45 million; however, it is now owned by a private corporation and tours are not available. The Octagon House was originally built by Colonel James Tayloe III in 1799. Tayloe’s role in Congress meant the house was heavily utilized by the Washington elite, including President James Madison. However, hauntings in the house are not a 20th-century creation. As early as the mid-1800s the spirits of dead slaves were said to ring the servant’s bells. Two of Tayloe’s daughters are also said to haunt the house. The first daughter was rumored to have died in 1812 by falling down the stairs after a quarrel with her father, over being in love with a British soldier. In 1817 another daughter eloped. Like her sister, she argued with her father over the relationship, and she fell down the same flight of stairs, to her death. Although there is little historical evidence to back these stories, both girls are said to haunt the second floor landing. The most famous ghost rumored to be in the house is that of Dolley Madison. She and her husband, President James Madison, resided in the house from 1814 to 1815, after the White House was burned by the British. She is most often spotted in the front hall, bringing the scent of lilacs with her. Visit: Self-guided tours are free and available Thursday through Saturday from 1 to 4 p.m.and guided tours are available by appointment for groups of 5 of more. Guided tours cost $10 for adults and $5 for students. 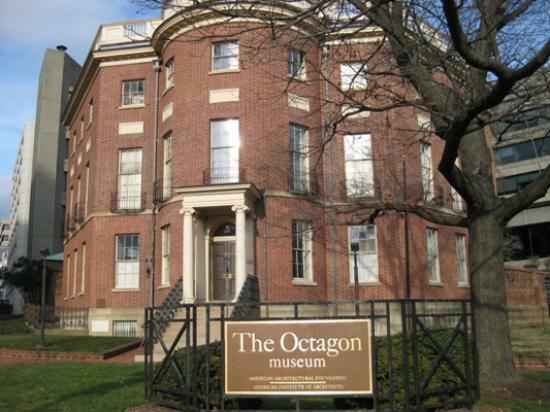 More information about the Octagon House can be found here. A place of horror or a scam for money? You decide. At 3 a.m. on November 13, 1974, Ronald DeFoe Jr. tragically shot and killed his parents and his four siblings in their Amityville house. The following year, in December of 1975, the Lutz family moved into the house. Within a month the Lutz family moved. Paranormal terror had driven them out of the house. All of the family’s odd experiences were captured in the 1977 novel Amityville Horror by Jay Anson, which then turned into a highly successful film franchise. Many critics claimed the Lutz’s story and the book included false information. But, their story remains one of the most prominent American ghost stories. Visit: The Amityville house was sold in 2017 for $605,000, just a little bit more than the $80,000 the Lutz family paid for it. If you’re looking to buy a house that isn’t haunted, come talk to TRELORA! We can offer you great service, a fair price, and tours that include no hauntings.